Helping you "One bite at a time"
We normally keep it for about 3 days in a refrigerator, the mixture does seem to stay nice and fresh. Take 2-3 spoonfuls every 2-4 hours or as needed. It can tend to have a drying feeling/sensation in the throat, so see what works best for you and adjust dosage to test. 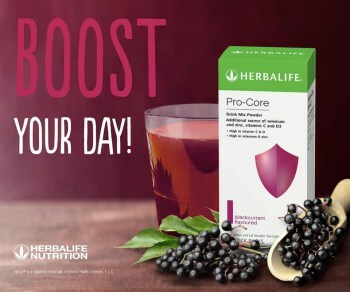 Herbalife Nutrition South Africa has announced an exciting addition to its targeted nutrition range of products, Pro-Core. Pro-Core is a water mixable drink powder, formulated with a unique complex of ingredients especially designed for everyday support. Its key active ingredient is Epicorâ, a yeast-based fermentate. The delicious blackcurrant flavoured drink mix is provided in individual servings (each serving is a 3.7 g stick pack) and can be taken once a day with 150 ml warm or cold water, or added to your favourite Formula 1 Shake. Pro-Core provides four essential vitamins and minerals and is particularly high in vitamin D, vitamin C, Selenium and Zinc(>30 % NRV). “Herbalife Nutrition’s Pro-Core, with its key properties that support the body’s nutritional needs, makes it a perfect addition to our family of nutrition products,” says Thilo Naidoo Herbalife Nutrition Country Director, Southern Africa. The essential vitamins and minerals in Pro-Core (vitamin D, vitamin C, Selenium and Zinc) all play an important role in vital everyday body functions. “At Herbalife Nutrition we believe that eating a varied and balanced diet, coupled with a healthy active lifestyle is key to living well. 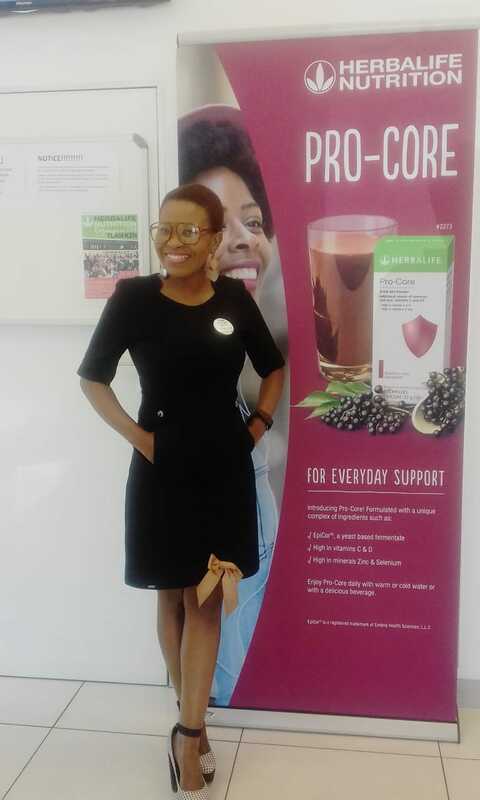 Pro-Core, when consumed correctly, can play a useful role in that lifestyle choice,” Naidoo added. Herbalife Nutrition’s Pro-Core comes in boxes of 10 x 3.7 g stick packs. Herbalife (NYSE:HLF), a global nutrition company, is reminding everyone across the country that winter office parties and family gatherings don’t have to turn into extra pounds this holiday season. According to Samantha Clayton, Herbalife’s director of worldwide fitness and education, it’s all about minimizing impact. “No matter where you are on your personal wellness journey, think twice before over-indulging during the next few weeks. 1. No savings: Don’t cut down or starve all day to enjoy the party at night. Skipping your breakfast and lunch is not a good way to avoid weight gain. There are many reasons why this is not a good tactic; a drop in blood sugar, lack of energy and lack of concentration are just a few of the downfalls of the “starve and binge” technique. Chances are, if you wait all day to enjoy the party foods, you will consume twice the amount because you will be so hungry. 2. Snacks: Have a healthy protein-rich snack before you head out to a holiday party. Filling yourself up on healthy snacks that contain protein will keep you full and stop you from having that extra cupcake. 3. Move around: Use holiday parties as an opportunity to socialize with your friends. Keep walking around and don’t park next to the chips and dips. Walking counts as exercise so the more you move the better. 4. Dance: Let loose and dance off the party calories; the extra bonus is that the more time you spend dancing the less time you will spend eating. 5. Routine: Don’t skip your workouts. The best thing you can do is keep your exercise routine intact. We all know holiday diets can go awry, but if you can at least keep your workouts going it will help. 6. Watch your drinks: Try to avoid drinking too many sweet drinks. It’s amazing how many calories can be hiding in a simple holiday punch (or eggnog). Staying hydrated with water helps. run. Stay active this holiday season by walking around the shops and carrying bags or boxes doubles up as a workout. outside and go for a walk. The more active you are the fewer pounds you will gain. positive active and healthy routine the better chance you have of reaching your personal health goals. independent distributors. The company supports the Herbalife Family Foundation and its Casa Herbalife program to help bring good nutrition to children. Herbalife’s website contains financial and other information about the company at www.herbalife.com. 9 November 2018 adminLeave a Comment on love cheese ? Loads of people think they love cheese but actually, it’s not quite the case. If you were given a low dose of methadone, which is used to get people off heroin then you would not think cheese tastes good, but why is this? Cheese has a protein in it, and a lot of this protein called casein. 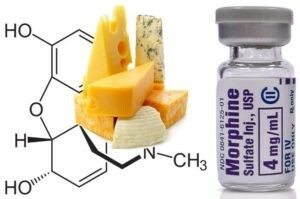 When the cheese mixes with your saliva it becomes casomorphine which is a type of morphine. Morphine makes you feel calm and relaxed, like all opiates. So really, it’s not the cheese you love, it’s the morphine.